The Boise National Drive Electric Week Car Show on Sunday September 11th was a terrific event with good turnout. It was the largest EV show in Idaho history with 52 electric vehicles on display from local owners and dealers, along with 15 electric bikes and one solar go-kart. 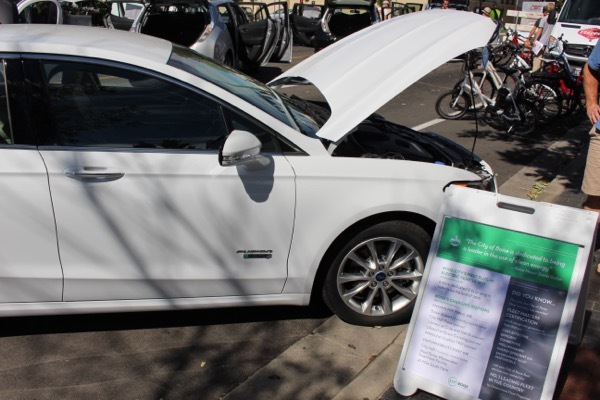 Mayor David H Bieter of the City of Boise issued a proclamation in honor of Drive Electric Week in Boise and had his plug-in electric hybrid at the event on display with information about the City of Boise's work with fleet electrification. Local event organizers were Idaho Sierra Club, Idaho Power and Treasure Valley Clean Cities Coalition. Additional event partners included American Lung Association in Idaho, Idaho National Laboratory, Boise State University, City of Boise, Dennis Dillon, Fairly Reliable Bob's, Lyle Pearson, Boise Electric Bikes, Idaho Mountain Touring, Auric Solar, Altenergy, Aurora, Empowered Solar, Blue Lightening Solar, GreenSpeed Research. Come see Idaho's annual largest display of plug-in vehicles. We are in a larger parking lot this year shaded by solar powered light poles and trees. We encourage everyone to sign up regardless if you are bringing a plug-in vehicle or not. Before you shop for a new or used car talk to the owners of plug-in vehicles without any pressure from the typical car dealer experience. Bring the whole family! Registered attendees report 298,829 electric miles driven.